Alfa Romeo GT PDF Workshop and Repair manuals, Wiring Diagrams, Parts Catalogue, Fault codes free download! Alfa Romeo GT (Series 937) is a sports car produced by the Italian automotive company Alfa Romeo in the period from 2003 to 2010. A total of 80,832 models were produced. GT was introduced in March 2003 at the Geneva Motor Show, and entered the Italian markets in January 2004. The car was going to the factory in Pomigliano d’Arco in the south of Italy together with 147 and 159. Like the 147th, the GT is built on the platform used on the 156th, but in the back of the coupe, created by Bertone. Most of the mechanical elements moved directly from the 156th and 147th, using double levers in the front suspension and the MacPherson suspension at the rear, which was mounted on both cars. The interior of the model is almost entirely based on the younger hatchback 147 and received many common elements. GT was equipped with exactly the same instrument panel and its functions, including climate control and a similar wiring system. Some exterior elements were also taken from the 147th: the hood, rear-view mirrors, front fenders (with 147 GTA). The line of engines consisted of 1.8 liters. and 2.0 liters. petrol engines, 1.9 liters. turbodiesel MultiJet and top in the line of engines – gasoline 3.2 liters. V6. 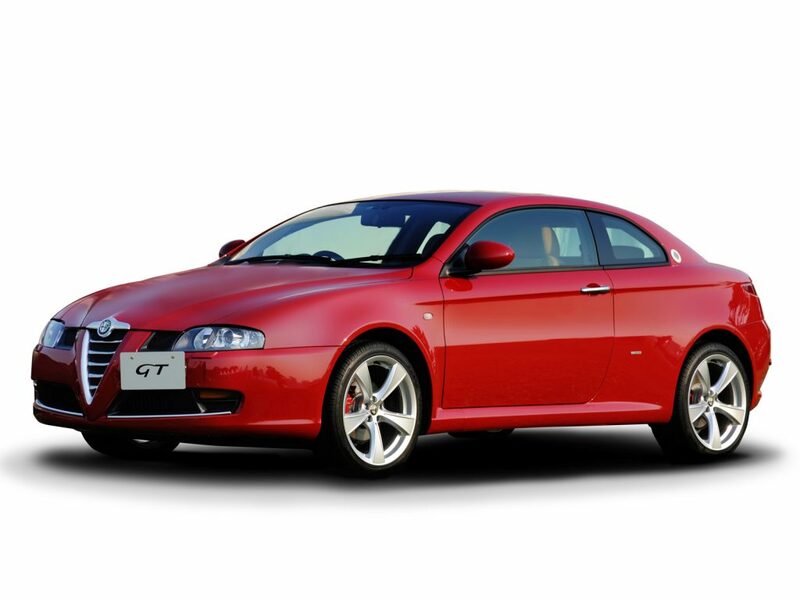 In the lineup, the Alfa Romeo GT was positioned as a sports car with the Brera, which was based on the mid-size sedan or the versatile 159. Both models could be considered followers of the 916 series – GTV. Two models could not remain in production, because in their class they competed with each other. Since Alfa Romeo was the sports wing of a major concert Fiat Group, and at that time Fiat did not have a sports model in production, so the company could not provide a place for the production of two identical sports cars, so that each remained in production. Historically, Alfa’s main strategy is to create and develop sports cars from its sedans and station wagons that have become more recognized as among the Alfists, and have had successful sales in the markets. In 2006, Alfa represents 1.9 liters. JTD Q2 version of the GT with a limited slip differential and adds a new equipment option called Black Line. In 2008, Alfa introduced the Cloverleaf (4-leaf clover) modification as a limited series with new optional options: a lowered suspension, a new body kit, 18-inch alloy wheels. The modification was available only in several colors: black, red (alfa red) and blue. And several engines: 1.8 liters. and 2.0 liters. petrol and 1.9 liters. MultiJet turbodiesel. Since these engines were more efficient on this model. A few years before the end of production for differences with the Italian market, Alfa Romeo decides to launch several special versions for foreign markets. Special version 1.9 liters. JTDm 16 red or white color was available in the UK from several special dealers. Another special version was “Run Out Edition” with 2.0 JTS and only in black. In total, a dozen cars were produced, as well as a similar version with a slightly modified Pratola Serra 2000 JTS engine and special equipment: Bose audio system with USB, multimedia devices and Bluetooth, which in the future all models of Giulietta were equipped. These modifications had special shock absorbers and springs, as well as a special light gray leather interior and rear-view mirrors. Data of 2.0 liters. versions were only available for the Dutch market. For Australia and France, the GT was offered in a special equipment Centenario, and all models came with 1.9 liters. JTDm diesel engine. The Quadrifoglio Oro version (60 models total) for the Japanese market has become the latest special version in the history of the model.